In Part 1 of this interview we focused on the state of miniature golf in Australia and New Zealand. We exchanged emails in January with Allan Cox to talk about his obsession (in a good way) with minigolf trick shots. If you haven't visited it yet, you need to checkout his PuttPuttDownUnder YouTube page. Watching the ads is also bearable knowing that funding is going to charity. Minigolfnews.com (MGN): Just how many hours would you estimate you've put in so far in your 18 for 18 series and which trick shot took the longest to pull off? Allan: Typically I can make all 18 aces in approximately 4 to 6 hours, which include camera set up and other prep. The time depends on the difficulty of the course. Putt Putt courses can be done in a couple of hours due to the aceable nature of the holes. To date I have done approximately 35 courses with another soon to be added. The longest it has taken to make one of those aces was five and a half hours of attempts. With the trick shots the three balls holes holed on hole 18 on the jungle at West Ryde was the result of nine and a half hours of attempts over the period of a week. No real secret to this trick shot stuff, it is just a matter of having enough SD memory, plenty of video battery back up and a little patience and belief that the shot is possible. MGN: For you, what is the appeal of not only playing trick shots but getting them on to the internet? Allan: I guess for me it is a great way to fundraise for the charity that I support, Bear Cottage a children's hospice here in Sydney. They do great work. Having lost my young nephew Chaise aged 8 to cancer a few years back, I get to repay them in a small way and to continue Chaise's legacy. I guess I also try to promote the competition side of minigolf on my YouTube channel and having a putter in my hand doesn't hurt my practice/preparation for our local tournaments. MGN: Has an attempted trick shot ever defeated you? Allan: Just one. Early in the piece a few years ago when I ran out of SD memory trying to make a shot. It was quite random due to the eroded nature of the concrete surface. Lost quite a few balls also. It wasn't that spectacular so I never tried again. Made for a good outtake video. I now have over 200GB of SD memory so problem solved. MGN: Do you set yourself a limit of attempts or time to complete a trick shot? Allan: If I believe I can make a shot with my skill set, I will keep at it until I make it. It is almost like competing against yourself at times. Patience is key, then it is just a matter of having enough SD memory, video battery back up and I guess a little luck at times. Nine and a half hours is my record. That does test ones ability to concentrate. MGN: Are you surprised about the success of the Putter King YouTube videos? Allan: It is hard to believe. Never in my wildest dreams would I have thought I could amass over 5 million views and over 5,500 subscribers. I did not know that You Tube even existed 5 years ago. Thank you Putter King and The Putting Penguin for making it possible. In a world of Dude Perfect and How Ridiculous 5 million views for Mini Golf is a little crazy. MGN: What's the most audacious trick shot you have successfully made. 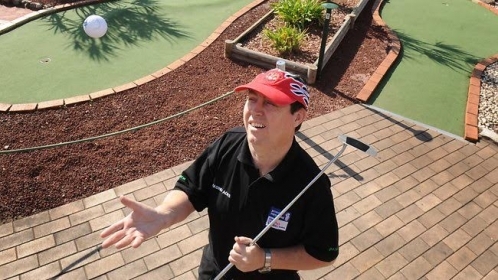 MGN: In some posts, you seem to doubt your competitive minigolf ability and yet, you are the current champion of Australia. Would you agree that you have some self-doubt? Allan: Back in 1997 early in my Mini Golf career I was lucky enough to play in the USA PPA Nationals week. I got to compete with players of the like of Brad Lebo, Greg Newport, Matt McCaslin Jay Klapper, Greg Ward and Randy Reeves. The best of the best. I finished midfield. A fair result. One tourament in front of Brad Lebo. I think I have improved since then and certainly more experienced. With 5 Australian professional national Medal play titles and 7 Australian professional Match Play titles over a 25 year career. The Australian Mini Golf win was big victory in the way of confidence. Not every day you beat a field with some PGA golf pros and some Australian rep level amateurs. So i guess for me it is similar to comparing Australian basketball NBL to the USA NBA. Yes we can compete but winning is another thing. Looking forward to meeting and competing against the kiwis in March this year who have been to the World Mini Golf championships. Hopefully my international experience will count for a good result in Auckland. Editor's Note: On a personal plug, I also took a crack at doing some trick shots on the minigolf course with not near the success of Allan. You can find those attempts on The Putting Penguin YouTube page.